40V-X ATTACHMENT CAPABLE STRING TRIMMER is rated 4.7 out of 5 by 3785. Rated 4 out of 5 by Monsterx7 from Good item, but does have some issues I've had this product for a year now and overall I am sissified with it. I like that I was able to still use all the attachments from my previous Ryobi gas power head. The battery life gave me enough time to trim, edge, and blow the driveway clean. The issue I just ran into was the charger not charging the batter. Called customer service and they are replacing the battery and charger without any hassles. The new battery has arrived, but I'm still waiting on the charger. After reading several review the chargers looks have issues, and they need to sort this out. Hopefully the new charger will last longer than a year (or actual half year) of weekly use. 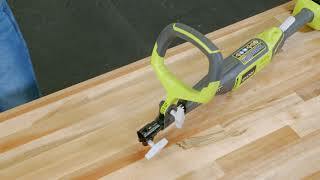 Rated 5 out of 5 by Tom71 from Great for my use I bought the Ryobi for light work around the house. I did not want something that required a cord or gas, both are a bother. I have only used a couple of times so far, but plan to trim weekly. It has worked great. The trimmer seems a little heavy to me, but I am not used to carrying a gas one around, or any for that matter. It seems the battery drops a little quick, but I only use for about an hour, and it says it is half charged, not sure how accurate that is, because it does not loose power. I would recommend to any for personal uses. I also like the fact the 40 volt battery is interchangeable with my chain saw. Rated 5 out of 5 by Drew616 from Great string trimmer I bought this over a year ago to replace my gas trimmer. I really enjoy using it. It's is lighter but most importantly it starts as soon as you pull the trigger. Pulling the cord 20 times and playing with the choke is a thing of the past. Another plus is that I can get different attachment for it. I have only bought the edger for it and it works well as long as you keep up with it. I have a corner lot with side walks so I do a lot of edging. The trimmer works well but does not do talk thick grass. The string is smaller. So overall great for trimming and edging small lot but I edge first, charge the battery and mow the lawn, and then i use the trimmer. The battery won't last to do both at once. Great price. Rated 5 out of 5 by ttrue12001 from Easy to use I kept burning out electric weed eaters/edger's so when I went to buy this, Home Depot employee happened to be in the same aisle and asked if I needed help. I explained what my issue was and he directed me to this Ryobi Expand-It Trimmer. I had never used a battery operated trimmer, I knew I didn't want to mess with gas, this is perfect! It is not to heavy for a woman, I do all my own yard work. I did get a shoulder strap just in case, but this trimmer works so much better than an electric one. Very easy to assemble out of the box. I also purchased the edger to switch out. I don't seem to use nearly as much line either. Rated 4 out of 5 by Ann2000 from Efficient & Easy to use I like having this cordless trimmer to do the edging near the curb, along the driveway and around my flower gardens! The only problem I see is that even though I am 5'6", it feels a bit too long and is somewhat awkward for me to manipulate. The other issue is that it is heavy at the bottom so it feels a little off balance. Once I figured out how to hold it, and got adjusted to both the length and the weight, it's easier now to use. I would suggest, however, some minor redesigning of the tool to make it more comfortable for use. I love not having a cord or using gasoline! Rated 5 out of 5 by Luke Skywalker 2016 from Great for the smaller size yard I purchased this trimmer 18 months ago understanding the electric technology it runs on. By knowing what I was getting I am completely pleased. I have a smaller ranch on a 8000sq ft lot , this is easily groomed with this trimmer, edger attachment , and blower. All while using only 2 full batteries. After each winter battery performance will degrade as I would expect. About 10-15% capacity loss each year. Typical life of each battery should be 3-5 years with proper maintenance. At $100 for each battery you are not saving money in the long run over a 2cyl engine, you are gaining convenience and that is all. Love the trimmer, only change that would make it a no brainer for the smaller yard is for Ryobi to include 2 batteries. Rated 5 out of 5 by Vjones35757 from Easy to use and never worry about mixing gas wrong We just bought this expandable pack for convenience and found it is indispensable! The gas trimmer starts when you squeeze the trigger...no tugging , choking or sloshing gas to fool with, just squeeze and it's a breeze to manicure yard. Then with a swivel and a tightening take off string trimmer and add the edger! It works beautifully and again no choking, tugging or cussing another 2 cycle gas mix! Then the leaf jet blower made short work of the grass clippings on the sidewalk! 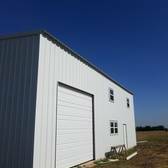 My yard is small and the 1 hour charge took care of all I needed done easily. The combo kit is perfect for the patio home set! Thank you Ryobi for this great product line! Rated 4 out of 5 by OhioBlue from No More Fussing With Starts Bought this trimmer because I'm done with the gas models...Since I was going to buy a new trimmer anyway, I thought I would give the cordless model a try. Immediate power and consistent power. I love never having to mess with starting a trimmer anymore. It does take a little time getting used to, but once you make the adjustments, it is very nice to just go and get it done. It's also great loading new line. No more unscrewing the head and setting the line and then winding...just line up the arrows, insert the pre-cut line, center the line, wind it up, and you are off trimming again in no time. My next purchase will be the RYOBI cordless mower! 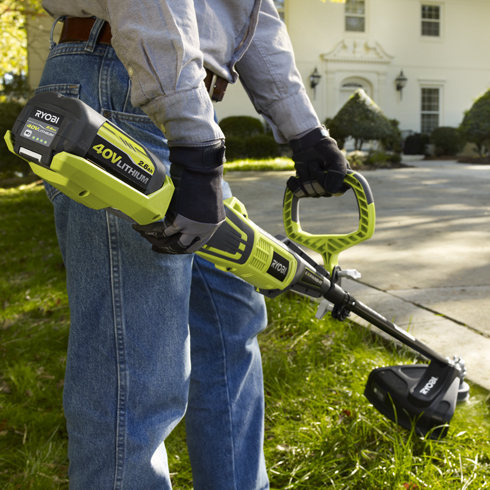 The RYOBI 40V-X Expand-it String Trimmer delivers Gas-Like Power™ without the hassle of gas and oil. This powerful trimmer features a REEL-EASY bump feed string head for fast and easy reloading; and premium .080 in. twisted dual line for cutting through brush and thicker grass. 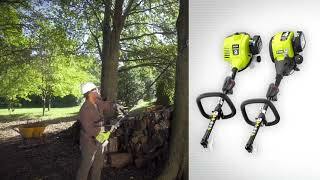 The RYOBI 40V-X Expand-it String Trimmer is the first cordless system that is also attachment capable. Add the Expand-it cultivator, blower or even edger to the bottom shaft of the RYOBI 40V-X String Trimmer power head to quickly transform your lawn from overgrown to manicured. This string trimmer puts users in control with a variable speed trigger and adjustable cutting width. The entire RYOBI 40V family runs off of the same 40V lithium-ion battery platform. The RYOBI 40V-X Expand-it String Trimmer is backed by a RYOBI 5 year warranty. 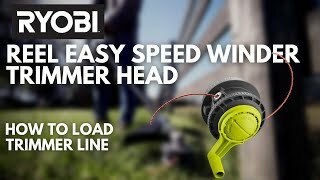 How do I attach the grass deflector on my RYOBI Cordless String Trimmer? Remove the plastic hardware bag from the grass deflector. Fit the grass deflector over the string head. Line up the screw holes in the grass deflector with the holes in the motor housing. Install supplied screws and tighten by turning clockwise with a phillips screwdriver. 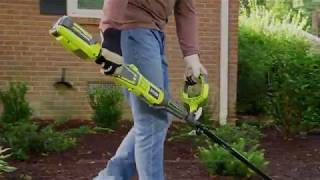 How do I start and stop my RYOBI Cordless String Trimmer? Press and hold the lock-out button. Release the switch trigger to stop the string trimmer. Upon release of the switch trigger, the lock-out button will automatically reset to the locked position. 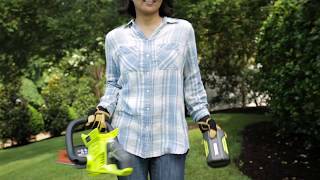 How do I store my RYOBI Cordless String Trimmer? Remove the battery from the string trimmer before storing. Clean all foreign material from the trimmer. Store the unit in a place that is inaccessible to children and away from corrosive agents such as garden chemicals and de-icing salts. 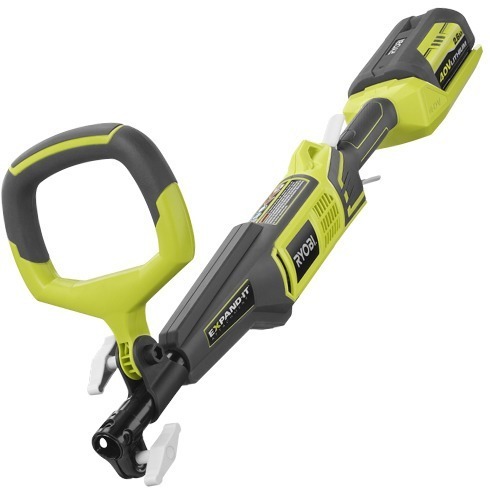 How do I attach the front handle on my RYOBI 40V-X String Trimmer? Loosen and remove the wing bolt and washer from the handle. Install the handle on the power head shaft. Adjust handle up or down, if necessary, to desired operation position. Reinstall the washer and wing bolt. Tighten wing bolt to secure. What do I do if my RYOBI Cordless String Trimmer won’t start? To secure the battery pack, make sure the e battery pack is snapped into place. Charge the battery pack according to the instructions included with your battery.